There’s no way around it: RVing without the Internet is like living without water for many people: it’s impossible. From mapping out a route to video calls with the grandkids, modern living requires connectivity. Unfortunately, getting online when you go RVing is one of the biggest challenges of a life on wheels, but the latest version of The Mobile Internet Handbook by Technomadia’s Chris Dunphy and Cherie Ve Ard makes it easier to get online with wherever you roam. Most people don’t give their Internet connection a second thought when they’re at work or home. Much like the water that flows from our taps, it’s cheap and plentiful and we don’t usually monitor how much data we’re passing. Getting online when you go RVing is much like living under drought conditions. That’s because every bit of data your computers and mobile devices use while you’re traveling can cost significantly more. To add insult to injury, most providers place restrictions on how much data those devices can pass, a process known as throttling. Maintaining a consistent, reliable Internet connection can be challenging, which is why The Mobile Internet Handbook is a huge help to anyone who wants to stay online while RVing. 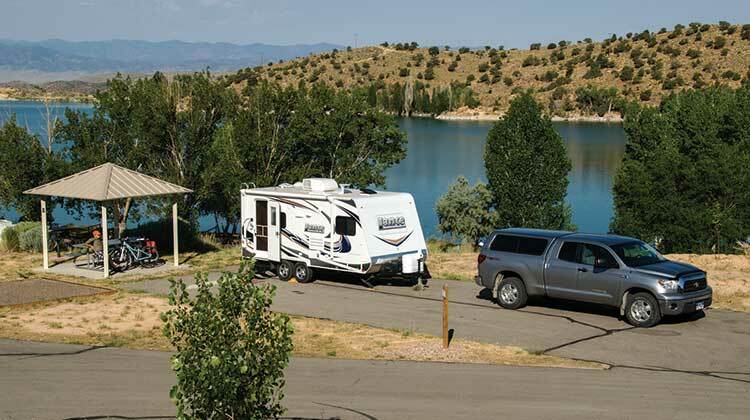 Whether you’re a tech novice or an experienced user who wants better ways to stay connected while RVing, the book has something in it for you. The book’s biggest strength for novices is a chapter called “Assembling Your Arsenal,” which guides readers through important questions to ponder while choosing an appropriate Internet access system for their lifestyle. “There is currently no one single technology for keeping online that is appropriate for all the different situations mobile users might find themselves in. The most fundamental key to success for staying connected while on the road is having multiple pipelines ready to try at each location. When Plan A is out of range or overloaded, Plan B suffers a hardware failure, a tree is blocking the signal to Plan C, and you ran over the wire to Plan D – what will you try next? How much redundancy do you need? 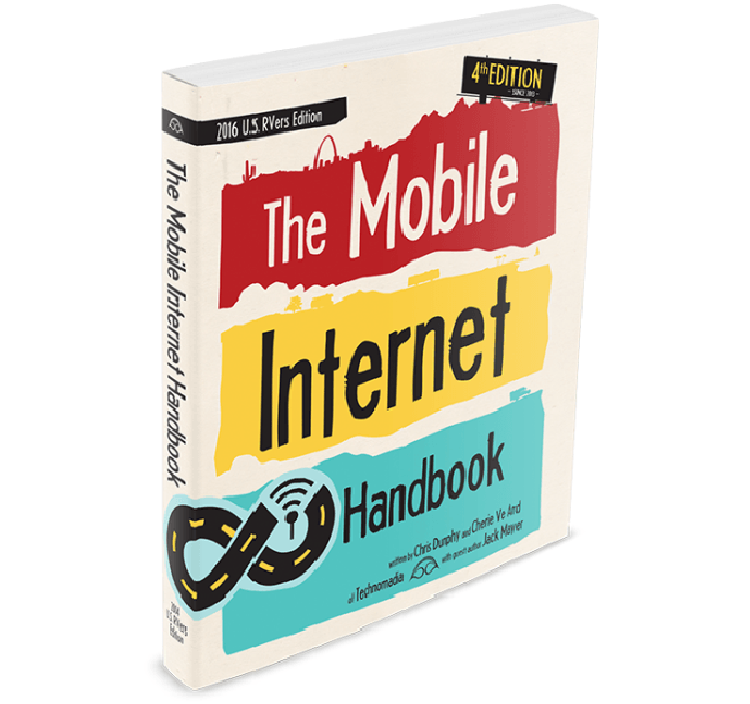 While The Mobile Internet Handbook helps readers understand pros, cons and different ways to get online, the authors also reiterate the importance of being realistic about Internet connectivity on the road. That’s because even the best Internet setups have challenges in remote places, especially when too many users are attempting to get online at the same time. For those who rely on the Internet to check in with business matters, having backup methods to access the Internet is critical. For more experienced Internet and computer users, the book has an assortment of technical chapters to satisfy your thirst for a better connection. For instance, the chapter written by Jack Mayer called “Antenna Selection and Installation” serves as a handy guide to finding your ideal antenna that will boost your WiFi and cellular connectivity signal. Since most people obtain cellular and WiFi connectivity through providers like Verizon and AT&T, The Mobile Internet Handbook focuses on this method of staying connected. For users who don’t want to be tied to cellular networks, the book briefly touches on mobile satellite Internet’s newest exciting developments. If you’re considering international travel, it even discusses getting online while RVing in Mexico, Canada and other foreign countries. Additionally, the author’s membership-based online community, RV Mobile Internet, is available to help wade through the murky waters of mobile Internet. Pick up a copy of this handy guidebook, join the Mobile Internet community and you’ll always know how to stay online wherever you roam. You are “spot on” with this review. Joining the RV Mobile Internet service is the best $$$ anyone that is serious about internet connection while traveling can spend. Their service includes a website where you can get your questions answered and learn what you need to know about staying connected on the road. Through membership, many of us have learned how to obtain the coveted “Holy Grail” of internet connectivity: the Verizon Unlimited Data Plan. The pros and cons of other “special” data plans that are good for RVers are also discussed in depth. Chris and Cherie also independently test (and report on) the equipment you need to stay connected: routers, antennas, boosters, etc. Where else can you find such unbiased information that “tells it like it is” and helps with buying decisions and understanding how it all works? Kudos to Chris and Cherie! The book is just icing on the cake, Subscribe to their service to get the most “bang for the buck”! Wow, now that’s a great experience! Thanks for sharing.